Please leave a review or feedback on my "Google My Business page if this blog post helps you. I'm a freelancer. Your positive reviews will boost my local search presence. Thank you! 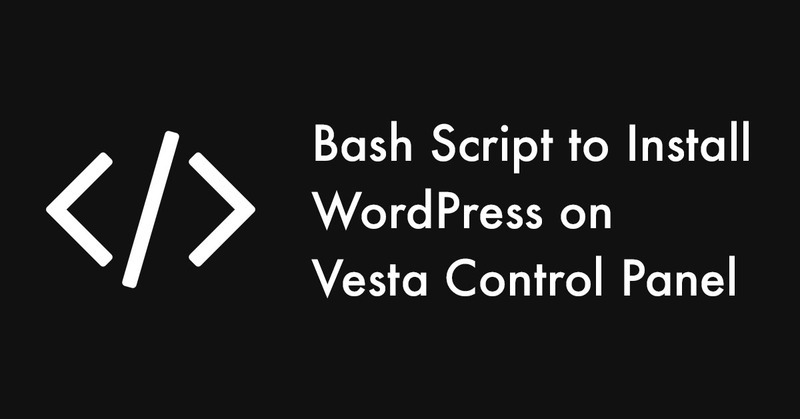 The Vesta control panel (VestaCP) is an open source hosting control panel, which can be used to manage multiple websites, create and manage email accounts, FTP accounts, and MySQL databases, manage DNS records and more. There are a lot of tutorials on how to install WordPress on VestaCP. The Vesta Control Panel comes with Softaculous, but you’ve to pay for the license to auto-install WordPress on your server using Softaculous. If you’re looking for a free option, an auto install bash script would be the right choice to install WordPress on your server. You’ve to add a domain first (using the Vesta CP web interface). The script is only applicable to the admin group. i.e. username:admin. Downloads the latest.tar.gz to the public_html of the user and domain you enter. Creates a secure .htaccess file & set correct permissions for the file. Generates a robots.txt file with right ownership. Creates a database with user and password you enter. Which will go to the wp-config file. Creates a wp-config.php file with generated configuration and SALT included. Method 1: Add this line your Bashrc file. Stick with this method if you plan to set up a lot of WordPress sites. This method will make things easier the next time when you want to install WordPress. bashrc is a shell script that Bash runs whenever it is started interactively. It initializes an interactive shell session. You can put any command in that file that you could type at the command prompt. On CentOS, you’ll find the bashrc file inside the /etc directory. Visit this thread if you can’t locate the file. alias wpinstall="curl -L -o 'vesta-wp.sh' https://gist.githubusercontent.com/mighildotcom/7205442783534792a606df39629e22d3/raw/a02564e5eb9931da31e3f4988717b6119a82ea6e/vesta-wp.sh && bash vesta-wp.sh"
anywhere to begin the installation process. This is pretty straight-forward also. The script will do the rest. Good luck!